Poetic Research Bureau: Noah Warren, Margaret Ross & Max Ritvo, Saturday Night! 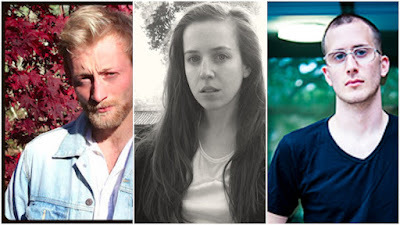 Noah Warren, Margaret Ross & Max Ritvo, Saturday Night! Please join the Poetic Research Bureau Saturday, April 16th at 7:30pm as we welcome poets Noah Warren, Margaret Ross & Max Ritvo. Noah Warren is the author of The Destroyer in the Glass, winner of the 2015 Yale Series of Younger Poets. His poems have appeared in The Southern Review, The Yale Review, Poetry, Agni, The Missouri Review, American Poets, and elsewhere. His work has been supported by fellowships from Yale University, the James Merrill House, and Stanford University, where he is a Wallace Stegner Fellow in Poetry. He lives in Palo Alto. Margaret Rossis the author of A Timeshare, selected by Timothy Donnelly for the Omnidawn Poetry Book Prize. Her poems and translations appear in A Public Sp ace, Boston Review, Fence, The New Republic and The New Yorker. Her honors include scholarships and fellowships form the Bread Loaf Writers' Conference, the Fulbright Program, the Iowa Writers' Workshop and Stanford, where she is currently a Stegner Fellow. Max Ritvo was awarded a 2014 Poetry Society of America Chapbook Fellowship for his chapbook, AEONS. His poetry has also appeared or is forthcoming in The Yale Review, The Los Angeles Review of Books, and as a Poem-a-Day for Poets.org. Ritvo’s eight poem sampler in Boston Review, introduced by Lucie Brock-Broido, was named as one of their top 20 poetry selections published in 2015. He is a poetry editor at Parnassus: Poetry in Review and a teaching fellow at Columbia University.